Lost City Asks "Who Goes to Capsouto Freres?" 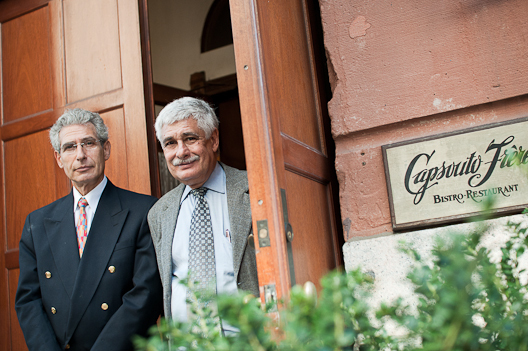 I have always loved Capsouto Freres in-the-middle of nowhere location, and the fact that there are actually Capsouto brothers who run it. I had an idea while dining there. Ever since Montrachet closed, my wife and I have been at a loss for a restaurant in which to have our anniversary dinners. Perhaps Capsouto. It possessed the right tone. Capsouto Frères turns 30 years old this year. It's amazing it lasted a month. Situated in the two bottom floors of a beautiful old 1891, neo-Flemish, landmark building on an isolated block of far west TriBeCa, to say it's out of the way is putting it mildly. The wall of traffic leading into the nearby Holland Tunnel all but dares you to try and find it. Labels: capsouto freres, who goes there? Lost City Asks "Who Goes to Two Toms?" First time I ever went to Two Toms, I ordered pasta and was bitterly disappointed. It was lifeless. Thereafter, everyone told me I had been a dope. Meat was the thing to order at Two Toms. Didn't I know that? This time I did better, ordering the famous double-thick pork chops. There was a side of pasta of course. I still wish it was better. I can make better pasta than that in my sleep. Better sauce, too. Two Toms should be able to out-do me. Still, a gem of a place. One of a kind. 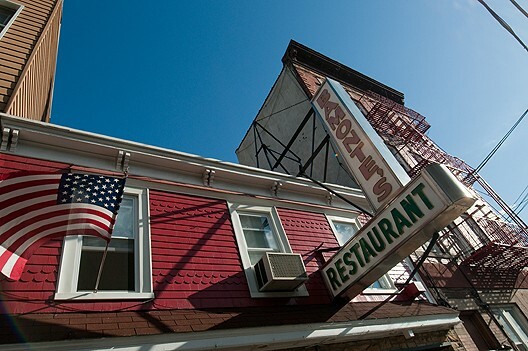 There are few very few places left in the city like Two Toms, the out-of-the-way oasis of bygone Mom-and-Pop, Italian-American dining on desolate Third Avenue and Union in Brooklyn, a stone's throw from the Gowanus Canal. Mario's on Arthur Avenue in The Bronx is one. I'm talking about the kind of place where the waiter tells you what's available, and there's no menu; where the food seems based on some distant relative's yellowing recipe cards, and is cooked by someone's mother; where the decor—if you could call it that—is equal parts social club, American Legion hall and grandpa's rec room. Labels: two toms, who goes there? Still, it's odd enough to have a certain appeal. I was forced to go recently when I suggested it as a place my niece would like, and my sister took me up on the idea. The best, and weirdest part, is the ghoulish hostess, who looked like Morticia's sister, and whom I assumed is part of the family that owns the place. Why else would she be allowed at the front of house, where she could scare all the little children. Another cool thing: the big, cast-iron metal clock inside was salvaged from a local butcher that went out of business years ago. Like Junior's and the Carnegie Deli, everything on the menu is huge. Christ, the menus themselves are huge. I knew this to be the case with the grossly oversized sundaes. 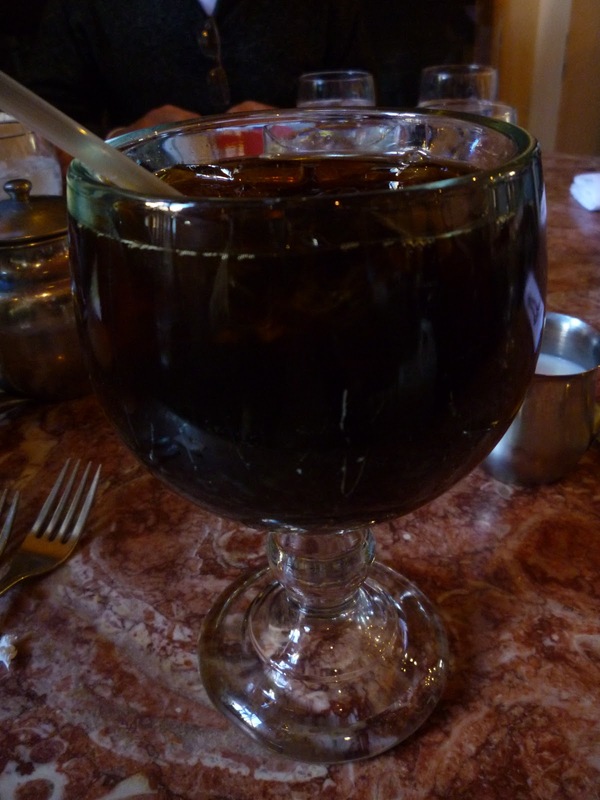 But I've never before been served an ice coffee big enough for a fish to swim in. Even my Goth niece was impressed with that. 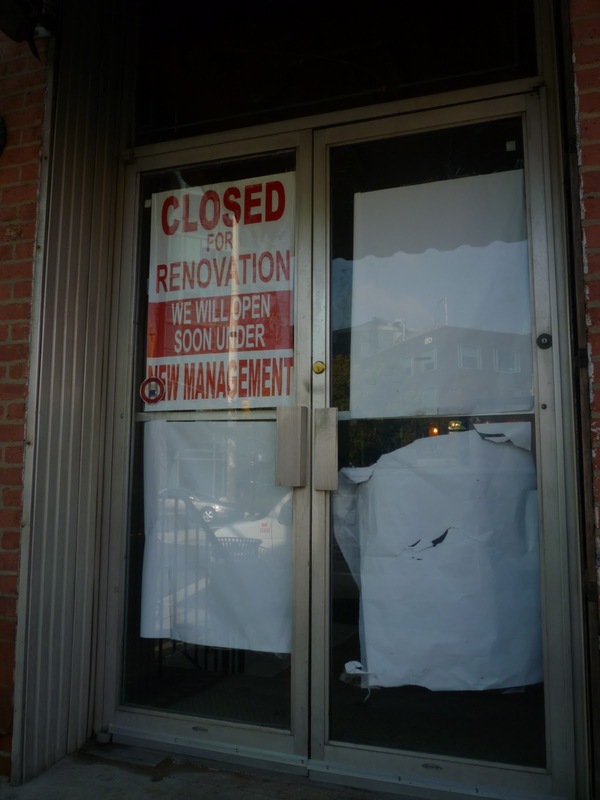 Brooks 1890 Restaurant, one of the oldest and most unheralded restaurants in the City, and one of my personal favorites, is closed for renovation. 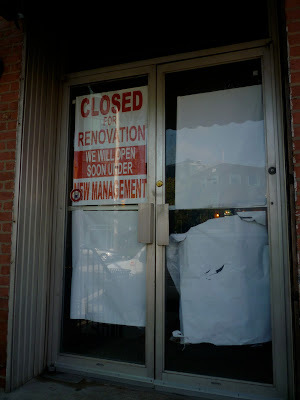 When it reopens, it will be under new management. 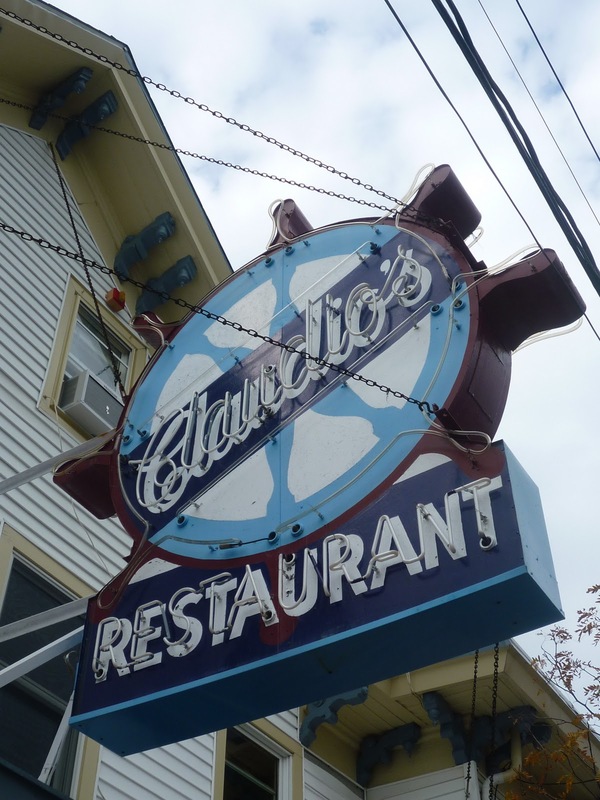 I went to this Aquebouge institution with the great name on a recent trip to the North Fork of Long Island. 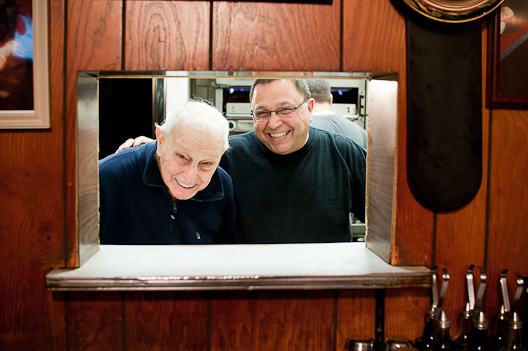 It's a family business, run by the Wittmeier family since 1950. Old fashioned diner, with counter seating and table service. Low ceilings, curtain, pressed-wood tables, tablecloths. Chicken Pot Pie, Long Island Duck, Meat Loaf, and "famous" mashed turnips. They must be really good. Why, otherwise, serve mashed turnips. Thought I would pass on some happy news. A year or so ago, Streit's—the old matzo factory on Rivington and one of the last vestiges of the old Jewish Lower East Side—bummed everyone out by saying they were selling their building and clearing out. So I was surprised to walk by the address the other day and still see matzos being cranked out of the small factory. What's more, there was a sweet little retail store in the space, selling every sort of thing Streit's produces. I asked the man behind the counter what was up. He said the plan to abandon the building had been, well, abandoned. They were staying. The reason he gave was that the old matzo-making machines were 80 years old, too ancient and too difficult to move at this point. This may be old news. Not sure. But it's new news to me. And good news. I bought a couple of cans of Streit's soup. Very salty and very good. A stray post here. Just cause I feel like it. My favorite is below. Whiskey Wind Tavern is one of the best bar names I've ever heard. It's open every day of the year. The folks at Eater, who like to map everything edible in the City, ask my to pick out of selection of old guard dishes from New York City's most venerable restaurants. 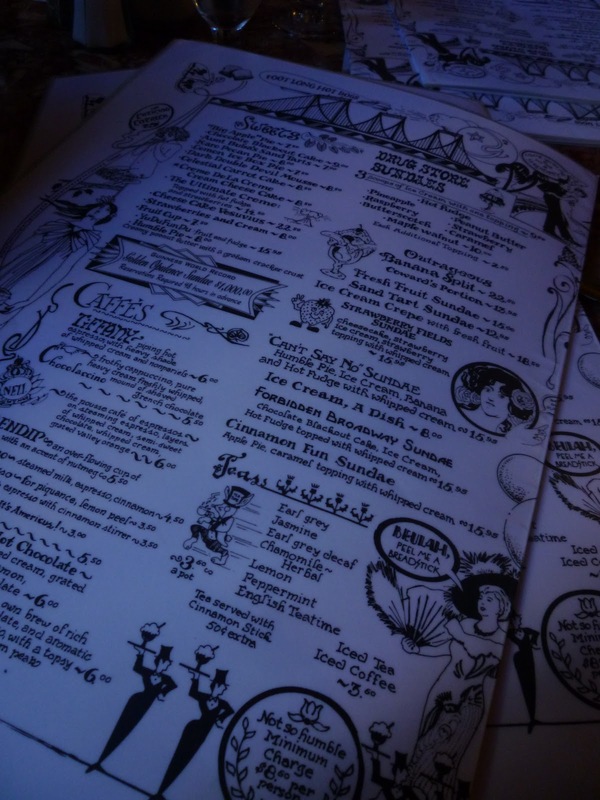 Mutton Chops at Keen's, Pastrami on Rye at Katz's, that sort of thing. Such a task is a pleasure for me, so I was happy to do it. Thanks to Zachary Feldman for putting the post together. Here's the intro. You'll have to jump to Eater to read the rest, because the layout is too complex for me to copy here. Lost City Asks "Who Goes Barbetta?" Despite the poverty of my checking account, I had actually been to Barbetta a number of times before I decided to make it the subject of a "Who Goes There?" column. Once, I interview actress Mary Steenburgen there, and another time I interviewed owner Laura Maioglio, who is genuinely cuckoo in that way that you associate with the progeny of aristocracy and the very rich. She wears custom made, one-of-a-kind clothes of which there are no duplicates and owns a palace in Piedmonte. 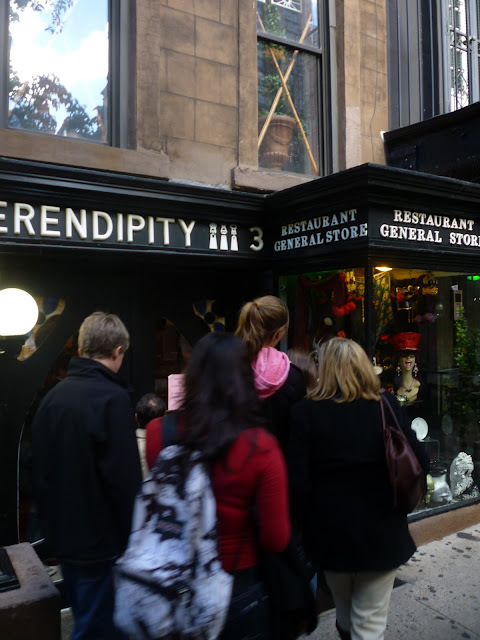 I dearly love the place, its beautiful sign and ridiculous chandelier, the fact that it has Brachetto by the glass and a white truffle festival every year, that it boasts of having served the first espresso in New York, that it's named after the founder's brother's moustache. The front part of Barbetta, the 104-year-old, grand Italian restaurant on W. 46th street, looks something like a old hotel lobby, what with its plush seating area, stately bar, wood-paneled walls and the presence of both a piano and a harpsichord(something not even the Waldorf Astoria can boast). Further on in the main dining room, which also seems to belong to a hotel: High ceilings, overstuffed furnishings and a huge, glass chandelier that once belonged to the Savoys. Laura Maioglio, the flamboyant daughter of Barbetta's founder, decorated the place with European antiques back in the early '60s and hasn't changed it since. It seems to live in an interesting place between louche and elegant—much like the raven-haired hostess, who had a Continental graciousness, but wrapped it up in Long Island high heels and a mini-skirt. Still, gauche though it may be in parts, Barbetta sure as hell casts the rest of Restaurant Row as a shabby affair. On a late summer day, that faux-19th-century dining room is deserted. Everyone is out in the garden, which has some of the most celebrated al fresco seating in the city. It's situated behind two neighboring buildings. (Maioglio owns both the Barbetta house and the two townhouses immediately to the left. Her father bought them from the Astor family.) There are trees and a central fountain framed by four stone cherubs. The atmosphere is genteel, subdued. Leaves gently fall on your table. A borderline supercilious head waiter rolls an old-fashioned dessert cart carefully over the stones, past the French-speaking couple with the bottle of red; the couple from England who want their photo taken; the Asian couple; the group of three old lady friends; the husband and wife whose little girl is dressed in a pink tutu. Barbetta gets a lot of international tourists in the summer, my waiter told me. In the fall, it switches over to regular New Yorkers, mainly older ones who remember when going to the theatre was a dignified affair. Occasionally you'll see a theatre bigwig, usually a producer or an English actor slumming it on Broadway. You need money to go here. The pre-theatre prix fixe is $58, and it goes up from there. The daunting wine list has pages upon pages of Barolos and Barbarescos (some of them rare) that will rob you of half your rent. The cellar is enormous and runs under all three buildings. Maioglio is fond of proclaiming Barbetta's many firsts in the areas of Italian food and wine. It was the first New York restaurant to serve espresso, she claims. Also Grignolino, Gattinara, Ghemme, Tiramisu, risotto, polenta, white truffles. It goes on and on. Hard to prove all this. 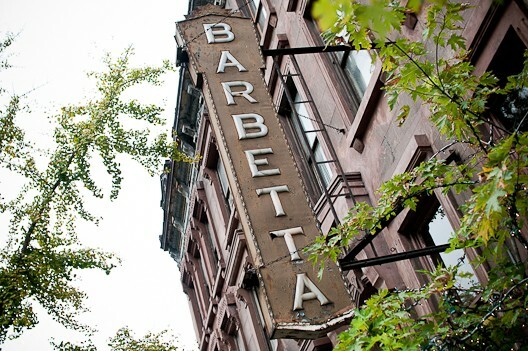 But if Barbetta, a lone haute Italian place at a time when New York was blanketed with red-and-white-checkered tablecloths, didn't blaze the trail, who would it have been?